If you have concerns about contamination from carcinogenic radioactive particulates then take Bicarbonate Of Soda.The US military recommend it in situations where nuclear fallout is present. Look it up yourself and do research on it. 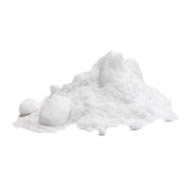 Its a common misconception that Baking soda contains Aluminium which it doesnt or else it wouldnt be Bicarbonate Of Soda when it is actually Baking Powder that contains Aluminium as thereis a difference between the two. Rip off artists will tell you their Bicarbonate Of Soda is "Natural" and doesnt contain Aluminium and will charge you up to 4 times as much as ordinary Bicarbonate of Soda when none of it contains Aluminium. Its as cheap as anything and you can get it anywhere.Its good for increasing energy levels as well as athletes use it to increase performance levels.